A World I Never Made by James LePore, a Mysterious Review. 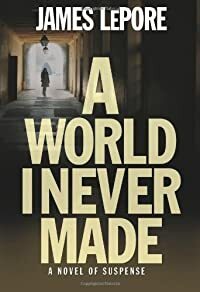 Review: James LePore's debut novel, A World I Never Made, is an interesting and well-developed character study but ultimately disappoints as a novel of suspense. Pat Nolan is summoned from the US to Paris to identify the remains of his estranged daughter, Megan, a purported suicide. Though the body is not of his daughter, he confirms it is. Suspicious he may be hiding something, the detective assigned to the case, Catherine Laurence, follows him. When Pat is attacked by two Arab men, she steps in, killing one and seriously wounding another who gets away. She subsequently learns the men are members of an Arab secret agency, and possibly terrorists. Puzzled by their interest in Pat, but also concerned for his safety, she takes him into unofficial custody. Together they seek to find Pat's daughter and learn why she may be the target of a terrorist organization. Set at the start of 2004, the narrative alternates between activities of Pat and Catherine in the present and episodes in Megan's life from the previous year. The title, A World I Never Made, is probably intended to reflect the character's current situation but is somewhat misleading, possibly intentionally ironic. The three main characters do live in a world of their own making, by the choices they've made over a lifetime. Over the course of the book, they, in particular Pat and Catherine, spend a considerable amount of time reflecting, wondering how their lives might be different today had they done something otherwise in the past. Actions, or sometimes inactions, have consequences and the plot is largely derived from the conflicts within the characters themselves. The author cleverly frames their story within the context of the terrorist bombings of Casablanca in 2003 and Madrid in 2004. The secondary characters are equally interesting, even though they receive far less attention. The gypsies, terrorists, and international government agents are all multi-dimensional, well drawn, and intriguing in their own way. But there is little mystery or suspense here. The ending is foretold well in advance, and the action scenes are surprisingly subdued, many lasting barely a sentence or two, at most a paragraph or so. Finally, and somewhat oddly, the author introduces a paranormal element that almost seems to be an editing afterthought; it doesn't work at all. Acknowledgment: FSB Associates provided a copy of A World I Never Made for this review.